What is the worst printer? NEVER get sucked in to buying a cheap printer which only uses 2 ink cartridges. The printer ink for these type of printers are VERY EXPENSIVE and are usually not available in generics. Also dont allow the asthetics of the printer to over ride your logic as there are loads of pretty looking printers around but can you afford to run them? Important: We strongly recommend when buying an inkjet printer not to spend too much money as the average life of a printer nowadays is between 1 - 2 years. Most often inkjet printers will die due to print-head failure or the drive gear wearing out. 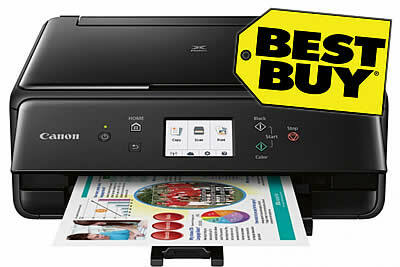 There are almost always good multifunction printers available on special for around the $60 - $80 mark if you shop around. It's not very often that I get excited about a printer however the Canon TS5060 has just gone and done it. It is a great buy at the moment, perhaps the best budget printer that Canon has released for several years. The reviews and the feedback on this little beauty are beyond anything I have heard of for quite some time. It is a multi-function, print, scan and copy with full wireless capabilities. The TS5060 uses 5 individual cartridges and they are readily available in generics at only $43-90 for the full set of high yield cartridges. This makes the TS5060 quite cheap to run, not only is it a great performer but it looks darn nice as well. I love how small it is and the fact that even though it's small it's loaded with features. At $88.00 you get a full set of inks included which are reasonable yield. These are a very popular little printer and should be good for a couple of years of trouble free printing. The beauty with this printer is that it is full multi-function but very compact in size. If size is an issue then this is the printer for you. The generic cartridges for these printers have become our biggest sellers as the printers are extremely popular. Grab one of these little gems, you wont be dissapointed. The Brother MFC J6530DW is currently on special at the Good Guys for $248-00 which is a really good buy. The Brother printers are great work horses and usually have a bit longer life than most modern inkjet printers. The Brother MFC J6530DW is a more high end, quality inkjet printer with all the bells and whistles to run your small business or office needs. The MFC J 6350DW uses the LC3319XL cartridges which we sell for under $60-00 for the full set, this price will drop to around $30-00 within the next month or so. This is perhaps one of the cheapest inkjet printers on the market in regards to printing costs. The only known issue with these is that the black print nozzle can clog if the printer is not used regularly. This is a common issue with all Brother inkjet printers however if used regularly it may never occur. 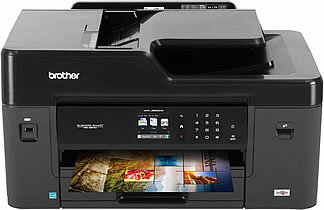 Some of the features of this printer include fast print speeds, Double sided printing, Fax and full Wi-Fi capabilities. I would highly recommend this printer if you are in the market for a high end inkjet printer that is reliable and cheap to run when using high quality generic cartridges. 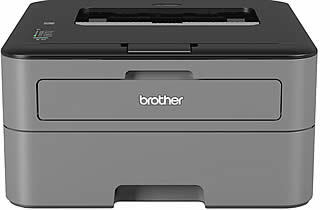 The Brother MFC J6530DW is a very impressive looking piece of equipment however be warned as it is physically quite a bit larger than the average inkjet printer. If space is not an issue then it's worth taking a look at this printer, you are sure to be impressed. If you want a great little printer that's cheap to buy, cheap to run and prints at high speeds then the Brother HL-L2305W is the printer for you. It is a Mono-Laser printer which means that it only prints in black and white which makes this printer ideal for the small office or home use. I actually just purchased one for our office to print out the eParcel labels. This printer is ideal for labels etc as the laser printout is very water resistant (unlike inkjet printouts). The Brother HL-L2305W is also quite compact in size and it works perfectly with generic toner cartridges. When using generic toners this printer is perhaps one of the most economical printers on the market. Using our High Yield Brother TN2350 toner you can print up to 5,200 pages for only $52-90. Hows that for value? One point I cant stress enough when buying a printer at your local Officeworks, Harvey Norman or any other large store is dont believe all of the advice that you are given. The number of people we get ringing up who have been fed the wrong information on printers is rediculous. I always tell people that the amount of training that most of these sales people have is only very basic as they have a huge range of products that they need to cover so their actual knowledge of various printers is minimal. This is in no way a criticism of these folks as I am simply trying to get accross the fact that we are talking everyday of the week to customers Australia wide so we know what works and what doesnt. Also we know which printers are cheap to run, easy to use and reliable so PLEASE take our advice on the printers we recommend. Please help to spread the word by liking or sharing this article on your Facebook, Twitter or Google Plus page. Owner of Ink Hub Australia Dean has been in the printer consumables industry since early 2007. In a competitive field such as print consumables many companies have come and gone but Ink Hub continues to grow and provide quality products and service. Dean's hobbies include fishing, web design, ham radio, travel, the beach, fast cars and family.